For our fifth installment of the season previews, we head out west where the Pac-10/12 has sent the same two teams to BCS bowl games for three years running. Can anyone (Southern Cal maybe?) break the duopoly that Oregon and Stanford have on the west coast? As I mentioned in the intro, Oregon and Stanford have dominated this conference for the past three seasons. Oregon won the Pac-10 title on their way to the BCS National Championship Game in 2010 and repeated in the first season of the Pac-12 in 2011. Last season they had to settle for a shared division title, but garnered an at-large BCS bowl bid anyway. Stanford lost just once in 2010, to Oregon, and tied the Ducks atop the divison in 2011. Both seasons, the Cardinal manged at-large BCS bowl bids. Last season, they finally beat the Ducks and won their first Pac-10/12 crown since 1999. That's long enough ago that Tyrone Willingham was considered one of the nation's best coaches. Since the beginning of the 2010 season, the Ducks and Cardinal have gone a combined 49-5 in conference play. Unfortunately for both schools, they have had to face each other each season. The Ducks have beaten the Cardinal in two of the three games. Thus, against all other conference foes, the Ducks and Cardinal have gone an incredible 46-2 the last three seasons! Oregon's lone conference loss besides Stanford in that span was by three points to Southern Cal in 2011. Stanford's lone conference loss besides the pair they dropped to Oregon was by four points at Washington last season. How dominant have these two teams been in that span? I'm glad you asked. The table below summarizes their scoring margins against their other conference mates since 2010. While the potent offense of Oregon has been more dominant, outscoring their league foes by over 24 points per game versus just under 21 for Stanford, both teams have doubled up their opponents on average the past three seasons. Perhaps more impressive for Oregon, is that among their 23 conference victims other than Stanford, 22 have come by at least double digits. The lone exception was their two-point escape at Cal in 2010. Stanford has played more close games, but 15 of their 23 victories have also come by double digits. Can the ridiculous dominance of the Ducks and Cardinal continue in 2013? In the ongoing conference preview saga, we turn our attention to the Big 12. Thanks to the depth of the conference, the Big 12 will be hard-pressed to put a team in the BCS National Championship Game, but the race for the league crown should be open and exciting. The Tommy Tuberville era at Texas Tech will certainly be remembered as a huge disappointment. While the Red Raiders went to, and won, a pair of bowl games in Tuberville's three seasons, his Texas Tech teams posted a cumulative 9-17 record in Big 12 play. By comparison, in the final three seasons of Mike Leach's tenure, the Red Raiders went 16-8 against their Big 12 foes and the Red Raiders had only one losing conference record under him (a 3-5 mark in his first season in 2000). 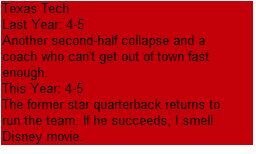 Perhaps more disconcerting was that under Tuberville, the Red Raiders stumbled to the finish each season. From September through much of October, the Red Raiders were a perfectly decent Big 12 team, posting a 7-6 conference record over three seasons. However, beginning with the last weekend in October and carrying on the rest of the season, the Red Raiders were just 2-11 in Big 12 play under Tuberville. What happened? Why did the team struggle so much as the season wore on. I don't know that I can ascertain the why, but I can certainly show the what. The table below lists Texas Tech's per play conference numbers in the September through most of October portion of their seasons. 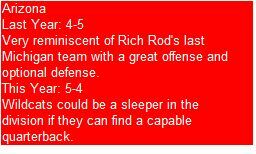 As stated above, the Red Raiders appear to be a perfectly average team. They have a small edge in per play numbers on their opponents and a mediocre 7-6 mark to go with it. Now here is what happened beginning with the last weekend in October. The offense got a little worse, but the defense played like a IAA school in the SEC, allowing an average of nearly seven yards per play over a 13-game sample size! Vegas obviously can't get a handle on the Red Raiders either. Texas Tech was 7-5-1 Against the Spread (ATS) versus the Big 12 from September through most of October, but just 2-11 ATS versus the Big 12 beginning with the last weekend in October under Tuberville. It will be interesting to see if Kliff Kingsbury can keep the Red Raiders from fading down the stretch for a fourth year in a row. Our next 2013 preview takes us to the midwest where the Big 10 will be spending its final season as a twelve-team league before adding Maryland and Rutgers (and totally reorganizing its divisions in 2014). To say Tim Beckman's first season at Illinois was disappointing would be a small understatement. No one expected the Illini to win the Big 10, but they had gone 14-12 over the previous two seasons with a pair of bowl wins. Plus, the 2012 season started off nice enough with a 17-point win over a decent MAC school in Western Michigan. Another 6-6 campaign appeared at least possible. 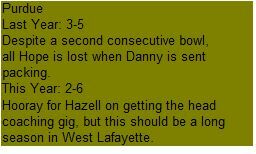 Even after they were blown out in their second game at Arizona State, the Illini returned home and took care of a IAA cupcake (Charleston Southern) by a 44-0 score. With a non-conference home game remaining against a mid-major (Louisiana Tech), and conference homes games Indiana, Minnesota, and Purdue (three teams that combined for an 11-26 mark the year before), a bowl game was not an outrageous assumption. Or so it seemed. Louisiana Tech walloped the Illini 52-24 and save for a close loss to Purdue, Illinois lost each conference game by at least 14 points. 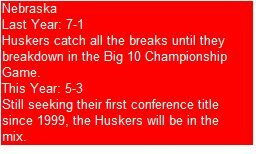 So, coming off a winless conference campaign, what is a reasonable expectation for Illinois in 2013? To answer that question, I looked at all Big 10 teams that went winless in the conference since 2005 and compared their conference statistics in a few categories to those of the Illini. The numbers I looked at were Yards Per Play (YPP), Yards Allowed Per Play (YAPP), Net Yards Per Play (YPP minus YAPP), Offensive Touchdowns (OTD), Touchdowns Allowed (TDA), and Adjusted Pythagorean Record (APR). The explanation for APR can be found here. 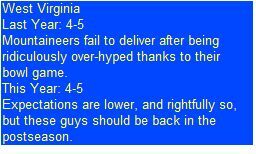 The results are summarized below. 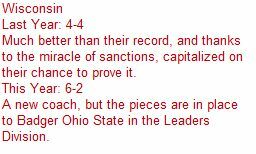 Based on most measures, the 2012 Illini were not the worst of the winless Big 10 teams. They did have the most trouble moving the ball and scoring touchdowns, ranking last in YPP and OTD, but compared to their (atrocious) peers, were competent on defense. One characteristic shared by all four teams was a rookie head coach. Beckman's predecessor, the esteemed Ron Zook was the captain of the 2005 Illinois team. Tim Brewster, unfortunately not of Brewster's Millions fame, was the head coach of the 2007 Minnesota Golden Gophers. 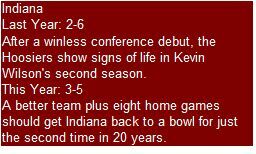 And finally, Kevin Wilson led the charge for the 2011 Indiana Hoosiers. How did those teams perform the following season? Illinois didn't get much better in 2006, winning just once in Big 10 play and finishing with two wins for a second year in a row. 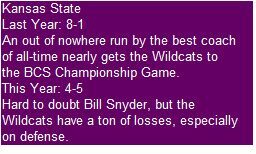 Minnesota, clearly the statistical class of these duds, actually managed a 3-5 conference mark the next season, advanced to a bowl game, and finished with a winning record at 7-6. Indiana improved to 2-6 in Big 10 play in 2012 and finished 4-8 overall. The 2012 Illini were much closer to the other Illini and the Hoosiers in terms of their play last year, so a reasonable expectation would be either one or two league wins. Accomplish that and win both of your easier non-conference homes games (IAA Southern Illinois and Miami of Ohio), and you've doubled last season's win total and probably guaranteed your coach a third year on the job. Our second season preview brings us to the newly christened American Athletic Conference. The former Big East will begin play in 2013 with a new name, and some new teams. Who is poised to capture the inaugural crown? Back in my Conference USA SDPI recap, I looked at how SMU had performed at home in league play the last four years under June Jones. If you don't want to bother clicking the link, I'll tell you the Mustangs are a sterling 15-1 at home against conference foes since 2009. Their road record, while not terrible, is just 7-9 over that span. 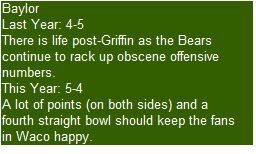 For this post, I wanted to take a deeper dive and examine how the Mustangs had performed on a per play basis on both offense and defense, at home and on the road. The table below lists SMU's home splits the past four seasons for their offensive and defensive yards per play. As you can see, the Mustangs have put up mostly solid, but only one season of extreme yards per play differential at home. Now let's look at the road numbers. Like most teams, SMU has performed better at home, but the Mustangs have actually been better on a per play basis that their opponents on the road, despite their losing record. One potential reason for this? Total randomness. While SMU has gone a spectacular 15-1 at home over this span, they are an even more unbelievable 7-0 in one-score games, meaning their home mark is at least a tad buoyed by our friend lady luck. Meanwhile, the Mustangs are a more mortal 2-2 on the road in one-score games.